What is it exactly that makes a reader pick up a novel in the first place? Perhaps the title or the author’s name. In this case, I hadn’t heard of both before. But when I saw the book at the library, what particularly caught my attention was a single word in the gist- Lapland. It’s been a dream to visit Lapland and witness the ‘aurora borealis‘ and, now, that I am one step closer to this fascinating land (being a temporary resident in Finland), the word interests me the most. So I picked up this arctic thriller (a translated version of course) and on reaching home I googled the book and the author. Turned out, this one is quite a famous one. In fact, the book has won 17 international awards. Now, that’s quite a number. The reviews of the book are great too but I decided to do my own review just for fun. In a way, this will keep me on the right track for appreciating good literature. 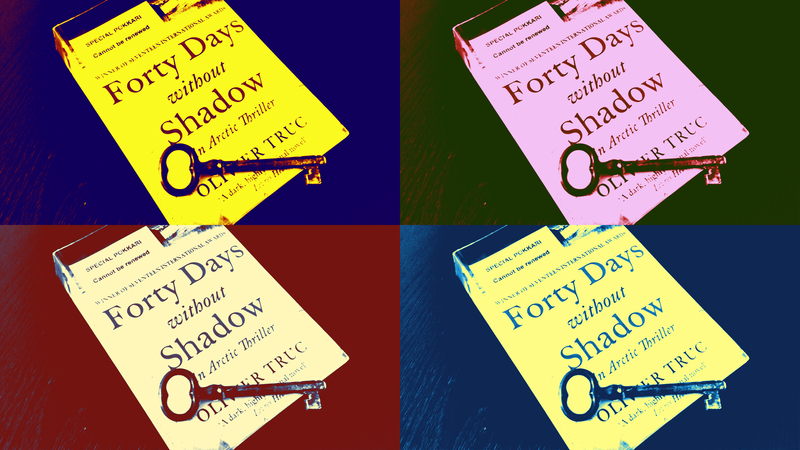 So coming to the actual review of Forty days without shadow, the story is gripping, a must needed factor in a crime novel. But the links between the characters are predictable at times. However, the connection between the events are very well plotted. But most of all, the book throws light on the lives of Sami people and their heritage, not to mention the discrimination they face in what otherwise looks like a fair society. Little did I know, the Sami are the sole indigenous tribe of Scandinavia recognized and protected under the international conventions of indigenous peoples. And more than that, I was amazed to know about the hardship faced by reindeer herders and to top it all the novel talks about a very interesting feature of Lapland-the ‘reindeer police’. What can be more incredible than this- a reindeer police force dedicated to maintaining the laws related to reindeer herding in Norwegian Lapland. Totally incredible and I can only imagine the hardship involved in this job. Overall, the novel kept me hooked (even if I am not a great fan of crime novels) and as expected the novel ends with the investigators successfully revealing all the secrets but the author deftly puts a human touch to the ending by revealing little extra- a personal bond or, in other words, a betrayal of a different kind. Lapland is the perfect place to set up the story of a lost Sami drum and its link to a cursed Gold seam hidden in the ‘frozen valley’. Besides, the mysterious murder throws light on other aspects of Sami traditions and the challenges they face in front modernization and materialistic pursuits of the so called civilized man. However, I was a little disappointed to find no trace of romance in the novel which is obviously a foolish thing to seek and had the author included a romance, the same would have killed the plot. Because, a fling or an affair between two investigators should have nothing to do with a murder or a theft. But the chemistry between the two reindeer police officers (Klemet Nango and Nina Nansen) is what makes them a great team for they think alike and push each other out of their ‘fear’ zones. Aslak, the savage, his wife Aila and his close friend Mattis- all their lives entwined together form a complex yet tragic web of tragedies and revenge. Only a person who has seen Lapland from the close quarters could weave a story like this and kudos to Olivier Truc as he is not even an insider but we bet he has seen much more than any of us. A French journalist, Olivier Truc, is based in Stockholm and his interest in Norwegian culture is a part of the work he does for La Monde, a French Daily. The version I read was translated by Louise Rogers LaLaurie.